A fabulous choice for your save the date! 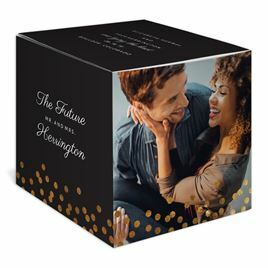 Sparkling foil polka dots are sprinkled below your photos and wording on this cleverly designed save the date photo cube. This 3-D cube is an affordable, stand-alone display your friends and family members will absolutely love. Additional postage is required for this save the date. Personalization Options: Polka dots are printed in your choice of three foil colors. Background and wording are printed in your choice of colors and fonts. Your choice of four photos.